It was one of those that I could not put down, the tears would run freely down my face. 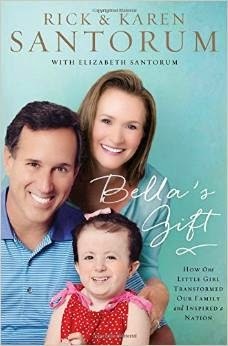 I was deeply moved by the beautiful story of this strong little girl and a loving family. Rick and Karen have opened up and shared the details of their daughter Bella. The book reads like a novel, but its a true story of hope of a remarkable little girl who beat the odds. Their youngest baby daughter was born with Trisomy 18. Most babies born with Trisomy 18 do not survive past a few days. "The doctors later told us that Bella-that Bella was incompatible with life. And to prepare to let go. They share their story from their point of view. This book is not about living with a child with special needs. It is not about a family that attempted to run for presidential office. It is about a family who has learned through various challenges and opportunities that life is precious, God given, and valued. Every life is one that should be advocated, treasured, and honored. It is a book filled with honesty, pain, love, joy, and passion. Get yourself a copy of this book, you will not be sorry.